We’ve posted a bit lately on Irish act, So Cow, but in case you missed those blurbs, and still haven’t heard of this group, here’s the scoop. They started out back in 2005 as the solo project of front man Brian Kelly, and then evolved into a three-piece outfit that’s put out four LP’s up to date. Back in July the band signed with Goner Records to put out The Long Con, which makes for their fifth full-length record of DIY guitar and lyric-central indie rock. They begin the album right off with their funky, off-kilter rock with a single “Barry Richardson,” which kicks in immediately with electric guitar that squalls and around the vocals and drums. This, along with the vocals from Kelly gives out a very meandering-post-punk vibe, but then the song manifests itself into a different animal for the chorus. Here, we see a switch to the straightforward chorus as the group joins him to repeat the title characters name. This switch is interesting because it creates a fairly large distinction between the off-kilter opening to the song and the more direct and harsh sound of the chorus. So Cow traverses this fine line for the majority of the album, constantly switching between the quirky and straightforward. Another track that really draws on this concept is “Guess Who’s Dead,” which has a drum beat that’s all serious business, while the guitar juts out at angles at the end of lines to begin. 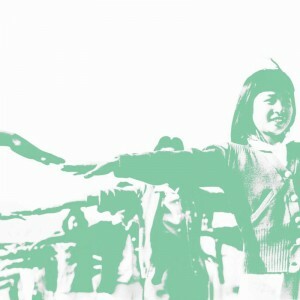 Again, the chorus gives out a more direct notion of indie-post-punk with the grit of a tinge of metal on the guitar. All the while, Kelly’s lyrics are the very opposite of serious, discussing the going-ons of people around town; the balance here is what’s so intriguing about the sound that So Cow is all about. My biggest qualm, albeit still fairly small, with The Long Con is that it seems to stretch on just a few songs too long. 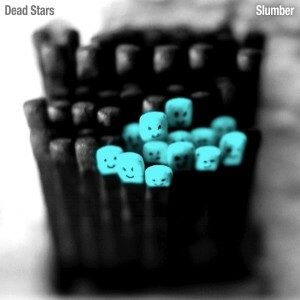 If you look at each individual song, track-by-track, you can see that this band really pulls off some interesting takes on indie-rock via their style, but it is difficult for a collection as long as this to hold your steady attention for the duration of a forty five minute long album. The last song kind of fizzles out when it comes to the energy of the record, leaving you on a slightly flat note; it makes you question the organization of the album and the incorporation of some of the tracks. 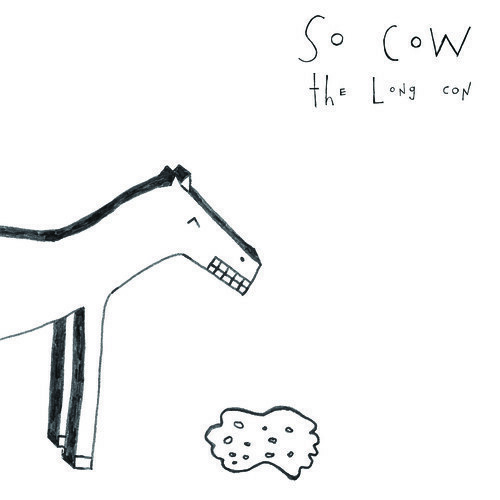 That being said, The Long Con, minus a few minutes, is a quirky and enticing album. Fans of the band will enjoy the twang of not only the lyricism that Kelly brings to the table, but also of the more direct pieces of rock-n-roll. Ever find yourself getting lost in a song, only to snap back and realize you’ve been somewhere else entirely for the past few minutes? Maybe you were walking down the street with your headphones in and looked up just in time to avoid walking into that phone pole. Or maybe you were studying in the library and looked up to see everyone was staring while you were sub consciously fist pumping the air like some Jersey Shore idiot. Admit it, if you’re reading this you are enough of a music lover to have been there, probably more than once. 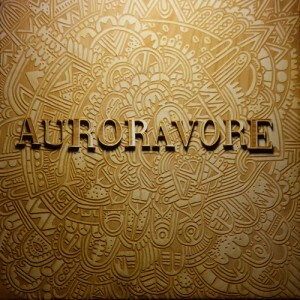 Auroravore is one of those bands that will take you to that place. 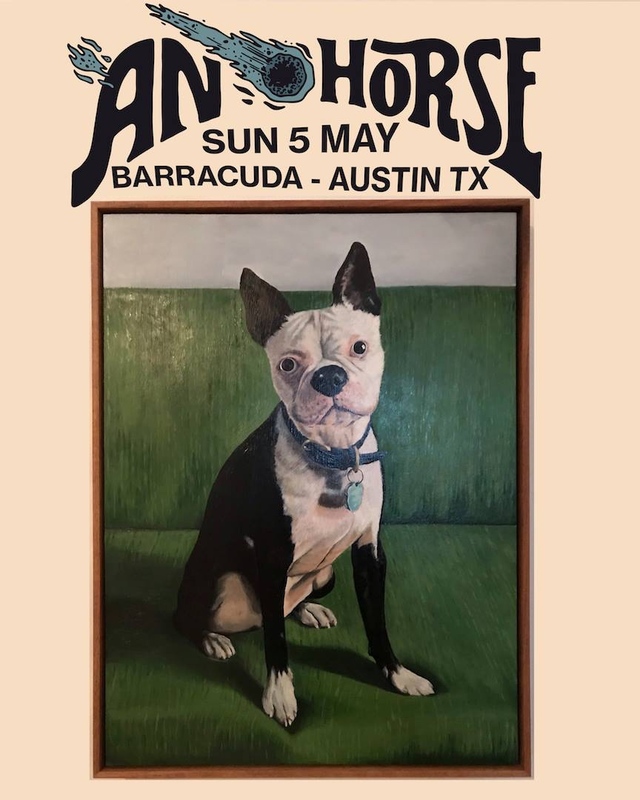 While the band has been a mainstay on the Austin music scene for long enough to be called veterans, they had a quiet year until the end of 2013 when they released their eponymous debut album in December. The album is a cohesive 9 song piece of work. On first impression it immediately evokes Of Montreal’s groovy psych pop and the pastoral layers and playful instrumental melodies of Air. The heart of this band is in the interplay between the keyboard and guitar, and anyone who has had the pleasure of seeing this band live can attest to the fact that they bring a Fender Rhodes and Moog Voyager to every show. In this day and age of cheap, light, and versatile digital synths and keyboard, lugging vintage gear around to shows is a tonal testament to dedication. 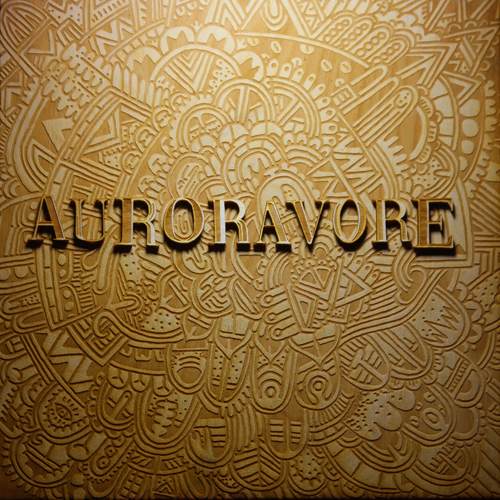 Auroravore is successful in creating a unified aural feel to the album. They never lose their groove or fall out of the pocket. Song after song the Keyboard and guitars make parallel runs evoking electronic droplets of notes. The tone of the music is a cascading groove of layers. At times, this is a double edged sword. After multiple listens, I found my attention beginning to drift. My “in the zone” would occasionally turn into a “zoned out”. While tonal cohesion can be a strong point, looking forward this band will need to grow out of the eighth note pentatonic melody lines if they want to maintain the audience that this album could attract. The key track for me in this album is “Who Goes Home”. While there are certainly more danceable songs (Falls Down or Comfortable), this track is a perfect slow burner, mirroring the lyrical subject with the musical arrangement. The lead vocals play a call and response with the keyboard and guitar, alternating a lilting falsetto narrative verse with a percussive quarter beat guitar hit. All of this energy and emotion is wonderfully curated by the drummer’s groove. The song culminates with repetive phrasing of the track title, and cadences with a final instrumental ascending melody, leaving us wondering who went home. The Fresh and Onlys have been on fire, more or less, for the last five years. No matter what they do, it’s hard to find detractors of their musical accomplishments, and yet it still seems like the band have something to prove, or room to grow. 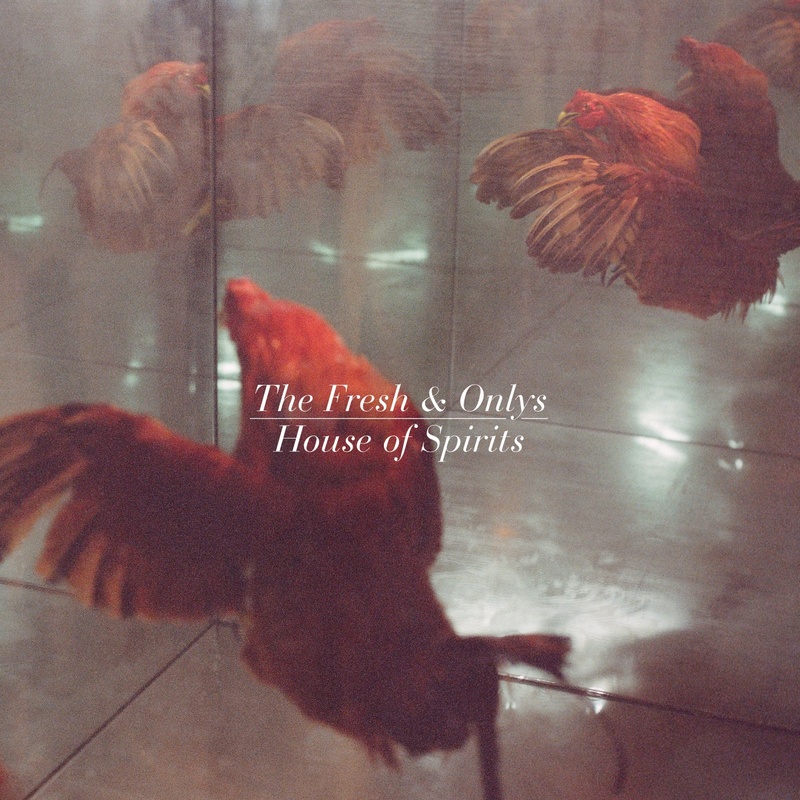 House of Spirits is a record draped in imagery, largely crafted during a period of isolation in Arizona for member Tim Cohen; it’s an example of how well the band works when crafting songs together. “Home is Where” opens up with little more than Cohen’s voice, illustrating the bare bones approach that led towards the completion of the record. Soon, the rest of the group joins in, providing a spirited pace that comes off as an exhilarating stomp with cascading guitars falling through the cracks left by Tim’s haunting voice. It gears you up for “Who Let the Devil,” which is perhaps one of the best songs the bands have written to date, seriously. There’s a trickling bit of guitar beneath the cymbal work, leaving room for the distant howl of Cohen to lurk in the distance. While the vocals still hold onto the traditional fare from Fresh & Onlys, they also soar into a loftier pitch during the chorus. But, like most affairs from the band, they don’t stand in one place for too long. There’s this feeling of contemplation that permeates House of Spirits, but perhaps no track exemplifies this more than “Animal of One.” I’ve grown fond of the line “the point of forgiving is so you forget, that being forgiven is all in your mind.” Taken out of context, it might not seem as drastically poetic as I feel it is, but put into the context of this track and the album, it takes on greater meaning. The delivery of the chorus is also emotionally striking, rising high in the mix, while the rest of the song seems to hold back for some Western-influenced introspection. But, while the lyrical content of this album is superb, there’s also these little touches that have really brought the record alive. On “April Fools,” for instance, there’s a wash of keyboards just barely audible. It’s not particularly forward-thinking, but these little flourishes have really added to the depth of sound in the band’s writing, demonstrating just how much they’ve grown since their inception…they seem to have left the idea of psychedelia behind, in some respects. This is especially evident on “Ballerina,” which comes across like a track that the Walkmen would have written at their best; it’s a simple ballad that works atop a simple percussive element. You’ll also find a backing vocal that perfectly accents the chorus from Cohen. And such are the fine touches that make the group rise above their peers. 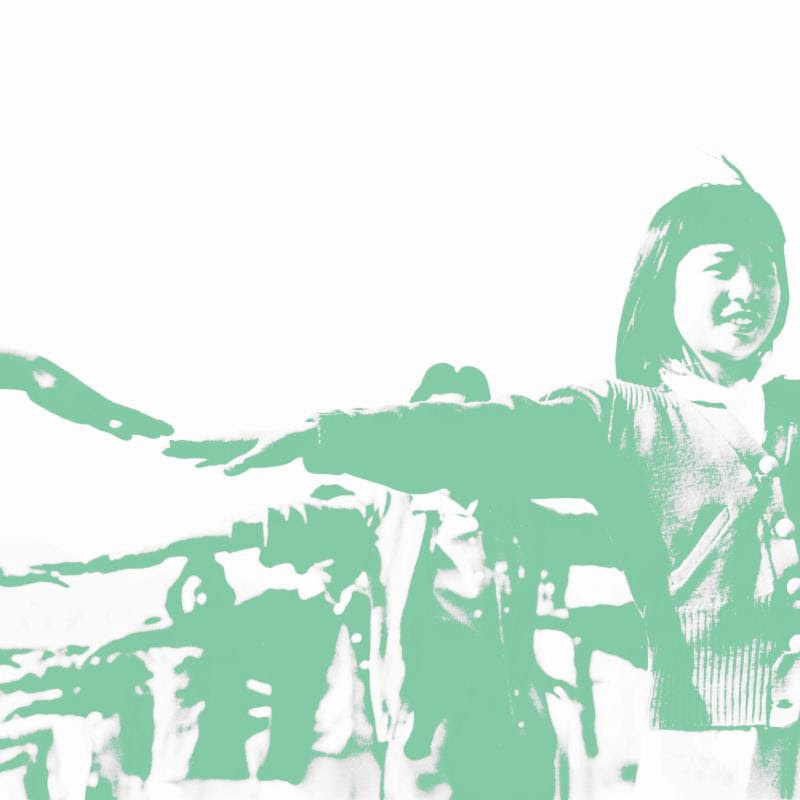 For me, there’s a change in the sound of Fresh & Onlys, and one that’s been foreseen if you’ve followed the work of the members outside of the band, such as Magic Trick or Wymond Miles. On House of Spirits, the band seems to have brought in elements from all their various projects, leaving listeners with a cohesive record that will long stand up in the hearts of its audience. When I first received Dalliance in the mail I had to go back and listen to the debut, Are You Falling in Love. It reminded me of just how great the songwriting was, though I felt the first LP was a bit uneven in spots. On the return for Gold Bears, this is not the case; the songs here are successful in every single way, with not a single throw away of the eleven tracks present. Dalliance opens where Are You Falling in Love left off, starting things with “Yeah Tonight,” but this round you’ve got an immediate winner. The idea has been shortened, pounding away from the instant you press play. 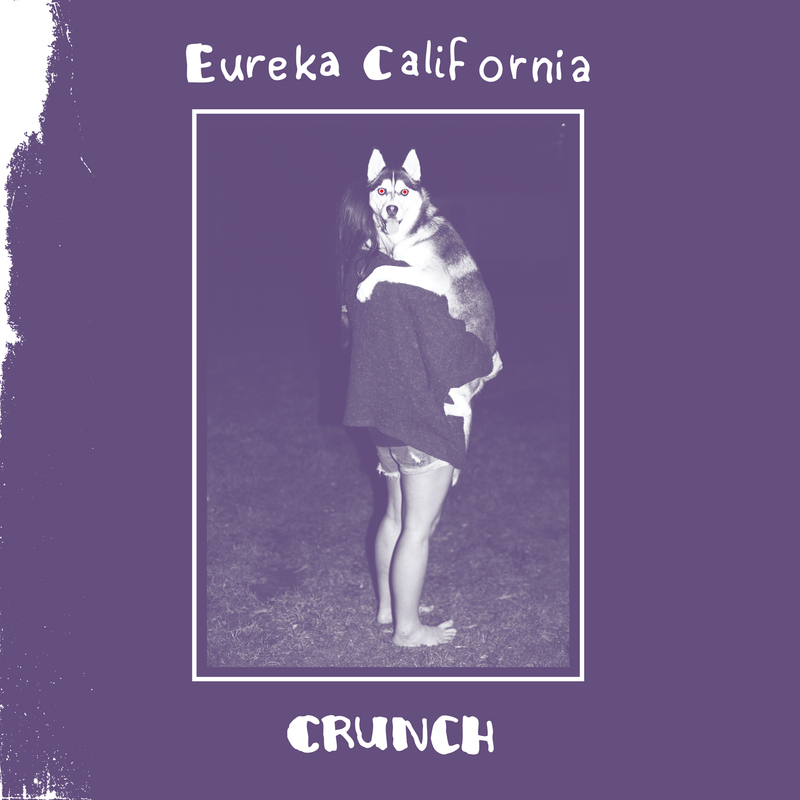 It doesn’t hurt that singer Jeremy Underwood is balanced out here by Emma Kupa (formerly of Standard Fare), as her presence provides a nice sugary dosage to a track noisily rocks from the get-go. Screeching guitars await around the bend with “Chest.” It’s reminiscent of The Thermals at their best, offering up punk intensity with hints of pop sensibility that make the song an undeniable hit; you’ll want to blast this with the windows down. But, while this new album from Gold Bears kicks you in the face, musically speaking, you’ve got to have a proper amount of balance; they accomplish that perfectly with “I Hope They’re Right.” It’s a ballad with a distorted guitar rocketing through the background, while a female vocal harmonizes perfectly with Underwood. It’s a nice bit of respite, allowing listeners to catch their breath for a short instant. Surely the gentle quality of this tune will illustrate just how far the songwriting has come since the band’s inception. It’s similar in approach to “Hey, Sophie,” at least in so far as both songs are meant, in my eyes, as breathers. They introduce soft moments, though “Hey, Sophie” uses more of a ringing circular guitar approach as opposed to a stretched out ballad with guitar accents. These songs tie the record together; they still hold to thematic points, but they give you a different approach from which to view the band. Still, Dalliance succeeds the most when it’s loudest, and no song illustrates that point more so than “For You.” As soon as the words “you’re a mistake” are uttered, the song comes crashing in. Drums pound and guitars course through your ears with ferocity, though I think there’s a definite infectious quality in the delivery of the vocal. At the point of writing, it’s probably one of my favorite tracks of the last few months. I especially appreciate how the song’s energy fades away into the back of the track; it’s a touch that I wasn’t expecting, but that caps off the tune in way that’s indescribable. Gold Bears had the tunes long ago, but I feel that Dalliance is the record where it all seems so right. There’s a vitality in the album that provides a connection with the audience; it refuses to fade. 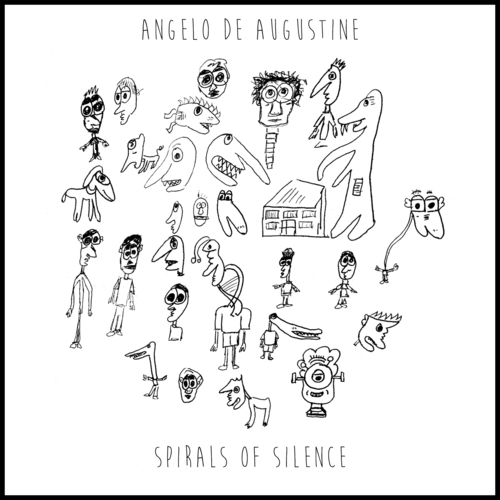 You can turn it up loud when you need to rock out, or you can have it as the perfect background to a backyard gathering, but regardless, you’ll feel this record crawl beneath your skin, inserting itself, permanently, into your consciousness. Michigan’s Cheap Girls don’t have some labored back story or some certain angle they can promote. Instead, the group, now on their sixth record, just offer up really clean guitar rock; there’s not schtick, no pretense, just good songs. It sets the tone for listening to the entirety of Famous Graves, an album chocked-full of really good songs. 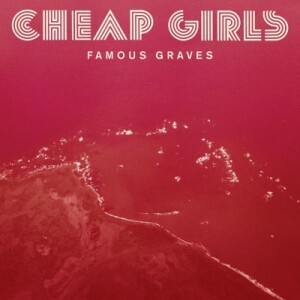 Famous Graves jumps at you right from the start with “Slow Nod.” A screech of feedback exits your speaker, and the drums immediately pound in while the guitar rings in discord. You’ll hear the vocals of Ian Graham wail steadily, with the music seemingly swallowing his melody. You need a guitar jam to start off your day? Best begin here. It’s one of the harder hitting moment on the record, aside from the one-two punch of “Pure Hate” and “Man in Question.” These two tracks offer a noisy dosage of guitars and crashing drumming. But, if you listen to the chorus of the former, you can hear the pop-centric approach the group has taken, surely endearing them to fans of all walks. On the latter, Graham offers a bit of a pitch-change in his vocal delivery, and it’s this touch that makes listening to Cheap Girls more than just your average alternative rock affair; vocal distinction does indeed go a long way…at least in my ears. Still, one of my favorite things about the release are the melodic moments that come far more frequently than one might expect. My favorite tune, at the moment, “Knock Me Over,” establishes that emotion on its opening lines, using a muted guitar while Ian’s voice carefully makes its entrance into the track. Sure, the song picks up a slight bit, but the band never shies away from using great harmonies. Perhaps this style is not mastered any better inside Famous Graves than on the closer, “Turns.” I like the usage of strummed acoustic guitar to dominate the track; Graham’s vocal performance here is also one of his best on this record. The ability of Cheap Girls to hold onto that melody while still being loud enough to be considered a rock band is quite important in regards to your listening experience; it’s that perfect balance that allows you to come back to each song again and again without growing weary. In an age where countless bands are regurgitating power chords and alternative rock stylings, it takes awhile to find something that makes a nod while still sounding unique in its own right. 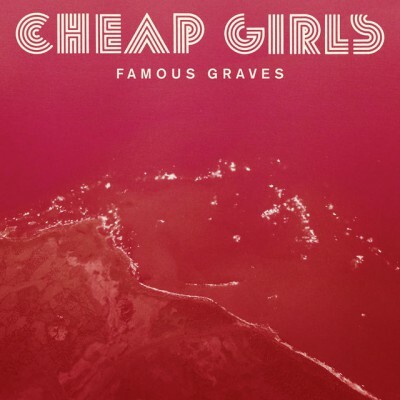 Countless hours of listening to Famous Graves indicates that this record is just that; it combines melody and loud rock n’ roll effortlessly, proving that Cheap Girls know precisely what they’re doing. If you like such things, then you’d be a fool not to stop in and spend some time on this album. Shrink Dust is the fifth release from Chad Vangaalen, so you’re likely to know what you’re getting into when you press play. You’ll find bits of ambling noise and samples, but most importantly you’ll find the heartfelt vocals that make Chad’s music so enticing. In fact, this is how things start off here, which captured my attention immediately. “Cut Off My Hands” begins with a calmly picked guitar, recorded in a manner that lets you hear Vangaalen slide his fingers up and down the fret board. 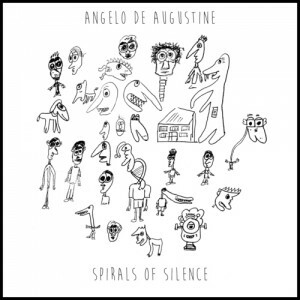 Then he enters with a stunning vocal performance; it’s the perfect pitch to fit the sound of his guitar, though I’ll admit the track gets a little bit muddy with excess touches of noise. It’s similar in structure to what you’ll get when you press play on “Lila,” another down-trodden tune that’s dominated by its simplicity. A slight touch of gang backing vocals and a solid guitar solo elevate this song just a touch, leaving it as one of my favorites on Shrink Dust. 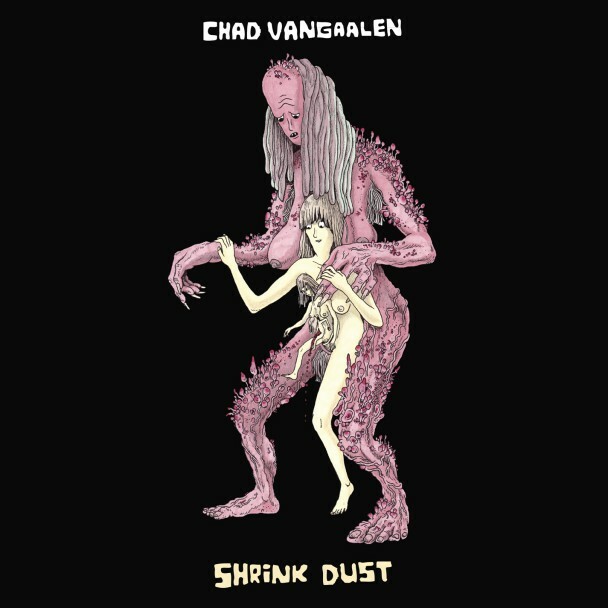 But, as many listeners will note, the guitar/voice combo is not the only area where Chad Vangaalen excels in his songwriting. Lately, he’s had a knack for incorporating multiple layers of sound into his tracks, building on top of a very simple song structure. Your first venture into this arena comes via “Where Are You;” this song features an affected vocal that adds a bit of an echo, while there’s a wash of floating noise that goes atop it all. His vocal delivery of the chorus of “where are you” borders slightly on the psychedelic vein, but not nearly as much as he opts for with the guitar sound on “Leaning on Bells.” Chad adds a little bit of bounce with the trudging guitar lines, but the way the syllables are drawn out on the lyrics is definitely reminiscent of the modern psych touch. Yet, what supersedes any of this is that Chad Vangaalen has quite a diverse sound in the grand scheme of things. “Monster,” another of my personal favorites, has this warble to it. A wavering vocal if you will. But there’s a swelling chorus that adds a perfect bit of pop to the fold. And while that song operates in the ballad format, it’s followed by the more folk oriented piece titled “Evil.” And just as that finishes, you’re off into the previously mentioned psych track, “Leaning on Bells.” For my two cents, that’s what makes listening to Shrink Dust so ultimately rewarding: none of these songs sound exactly like the one before it, though they’re all obviously related in theme and sound. Chad Vangaalen isn’t going to give you the same song twice, so you’re likely to spend hours listening here without getting labored by too many like-minded numbers. A little bit of time with this record, and you’ll be swearing on the Vangaalen bible.